Abseiling in The Blue Mountains was one of my most memorable adventures in Australia – besides surfing at Bondi beach, of course – and also more my kind. The Greater Blue Mountains World Heritage Area is the ideal scenic weekend getaway from Sydney. With the town of Katoomba as the base, you can spend all day in the Blue Mountains walking through the valley floor among forests that transport you to ‘Jurassic Park’, hiking back up to look out over the hazy blue forest (which gives this national park its name), all the while discovering waterfalls and rock formations along the way. Of these, The Three Sisters sandstone turrets is the most iconic. The Legend of The Three sisters has it that a witch doctor, Tyawan had three daughters Meenhi, Wimlah and Gunnedoo who accidentally anger the aboriginal mythical creature Bunyip, living down in the valley. To protect the sisters from the Bunyip, Tyawan then uses a magic bone to turn them to stone and himself turns into a Lyre Bird. But, in the process drops the magic bone and you see the Lyre Bird rummaging through the valley floor even today, it is said in search of this very magic bone. In consequence, it is recognised as a place of cultural importance for the aboriginal people. We were there for the weekend, put up at the YHA and spent a day hiking through the forest trails and up the Giant Stairway and another abseiling and sheltering under a cave watching the rain come in as the clouds closed in on us . While the evenings were spent unwinding in Katoomba. It was the perfect mix of excitement and idyllic. I had never heard of ‘abseiling’ till I was in Sydney. Rappelling yes, but not Abseiling. 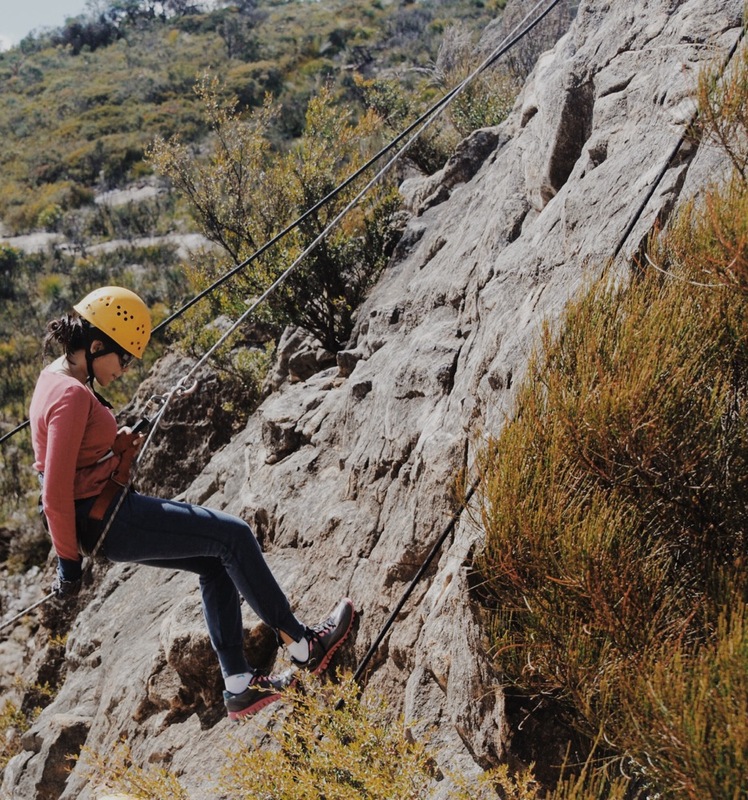 Coming from the German term Abseilen for ‘to rope down’, it is a mountaineering technique where you use ropes and a belay to descend a rock face/cliff too steep to descend on foot. As a beginner you start with 30 feet and then go on to a cliff with less foothold and more of a drop and then the final 60 feet sheer drop. & trust me when I say you will get high on it. For some one who loves the mountains and exploring, this was actually special, with that extra edge of adventure and I sure am glad that I did it when I could. Imagine an escapade like that with a view like this!